Share the post "Fall Garden Flowers And Their Origins"
Gladioli, asters, chrysanthemums, and everlastings are some of our common fall garden flowers. You may be surprised to learn the origins of these flowers, and that others in past centuries have used them as well. Most of our gladioli came from Africa, where the corms were roasted like chestnuts and are said to taste like them. (Corms are the swollen underground bulbous parts for storage of foods.). 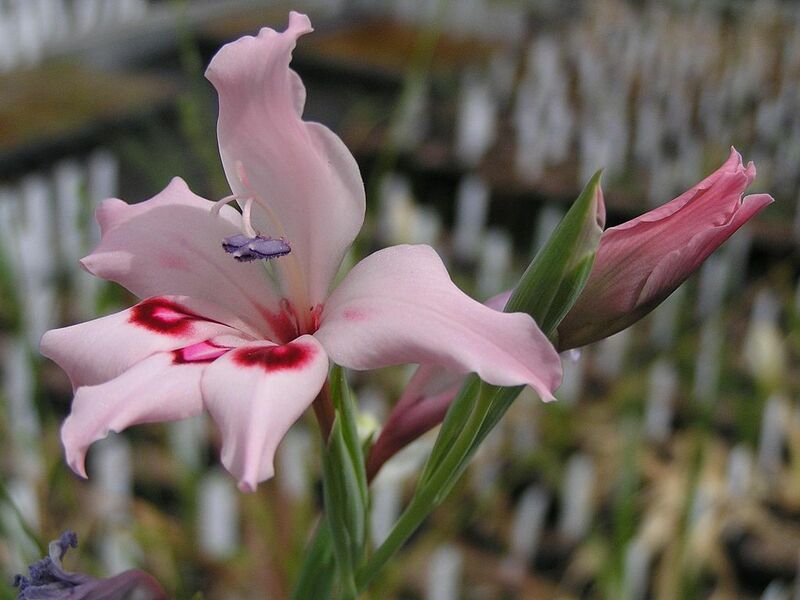 Even before these were introduced during the eighteenth century, primarily from South Africa, gladioli were familiar plants for centuries in the Mediterranean. Known in ancient Greece, the ancient name for this flower (xiphium) means sword, referring to the leaf shape. The Latin word for sword (gladius) gives us the name we know today. Rare gladioli even existed in ancient Britain, with the herbalist John Gerard referring to them as “Sword-flag.” One of the most noteworthy gladiolus introductions was in 1904 by Francis Fox. An engineer who built a railway bridge over the Zambesi River at Victoria Falls in Africa, Fox discovered the gladiolus by the waterfall which is responsible for the yellow and orange colors bred into subsequent gladioli. 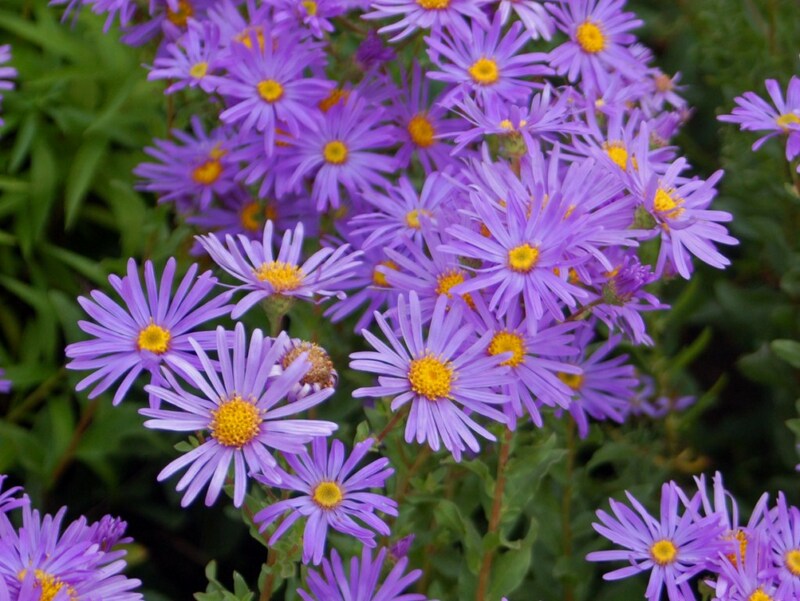 Asters in England originally came from Europe. The plant explorer John Tradescant the Younger (his father John also was an explorer) brought back the first North American asters to England in 1637. These and the European “starworts” were crossed for new introductions, with many recent selections this century. Since they bloom around Michaelmas Day, a late September holiday in Britain, they are referred to abroad as Michaelmas Daisies. 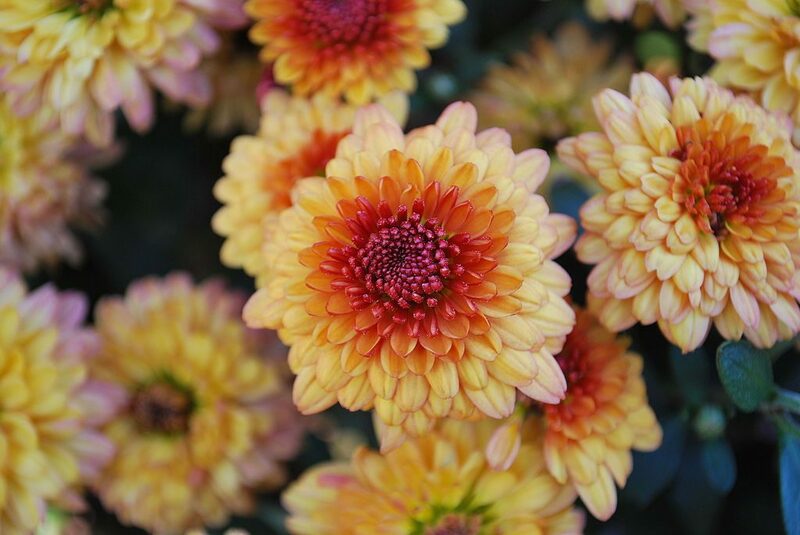 The fall chrysanthemum, fall mum, or hardy mum (not really hardy in northern climates) is actually a Chinese chrysanthemum, having been cultivated in China for 2,500 years prior to being introduced to the West. There they symbolized a scholar in retirement and were one of the four noble plants, along with bamboo, plum, and orchid. Dew from the petals supposedly gave longevity, with an infusion of the petals and leaves used for wine and medicine. Zen Buddhist monks took chrysanthemums to Japan around 400 A.D. The symbol of the Mikado, which appeared to be a Rising Sun, was actually a 16-petaled chrysanthemum. In 1795 the first mum was exhibited in England, with additional plants sent from the East by tea inspector John Reeves in the nineteenth century. The pompom mum was originally called the chusan daisy and was sent to the West by the explorer Robert Fortune. First grown in France, it was renamed the pompom mum because it resembled the pompoms on sailors’ hats there. Everlastings are so called since they seem to last indefinitely. 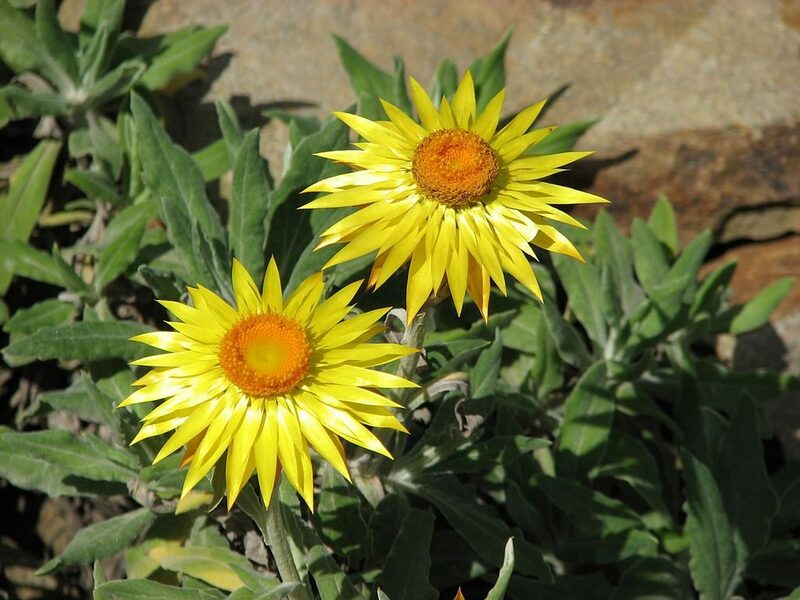 The scientific name Helichrysum came from the Greek for sun (helios) and golden (chryson). The Greeks used the flowers to make wreaths and decorate statues of the gods, as well as to mix with honey to treat burns. These flowers were known to the Egyptians prior to this time, however. A strawflower, the Oriental helichrysum, was brought to England in 1619 from Crete by way of the botanic garden in Padua, Italy. The everlasting we know in our gardens, however, is a species (bracteatum) from Australia. It was brought to England by Sir Joseph Banks, one of the few men on Captain Cook’s expedition to survive. Subsequently, Victorians used everlastings to decorate their hot and stuffy parlors where few other plants would survive. Today the many bright colors are popular in cutting gardens and dried flower arrangements. The next time you see a modern selection of any of these four flowers, stop a moment to recall their prestigious history–their centuries of ancestors and the many nations and cultures that have also enjoyed or used them. More can be found in the book by Diana Wells, 100 Flowers and How They Got Their Names .